Saying goodby to Sitka, we retrace our route through Olga and Neva Strait into Salisbury Sound. There are quite a few commercial fishing boats in the sound today which we must navigate around. These guys are called Trollers. They have numerous led weights hanging down from their outriggers with each weighted line rigged with many baited hooks. They slowly drag this through the water just as we would when we are fishing for salmon but with many more hooks per line. The King Salmon are in now however it has been a very dismal start to the fishing year for these guys. The King Salmon catch has been low and disappointing for many fishermen. Many areas are closed completely this year for Kings. In other areas, non residents are allowed only one king catch for the entire year. The Coho should be here in a few weeks and hopes are high for a good season with these. It seems like all species of salmon are being overfished. 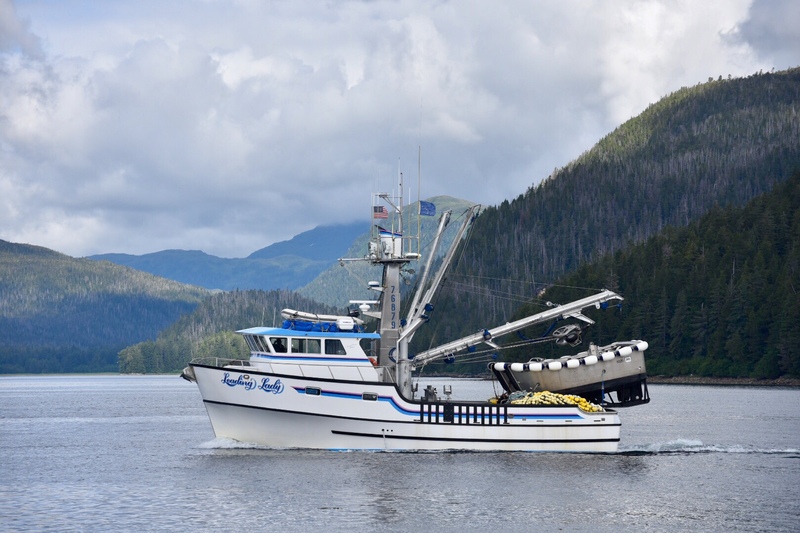 We pass one purse seiner heading to Sitka to begin his Coho season. 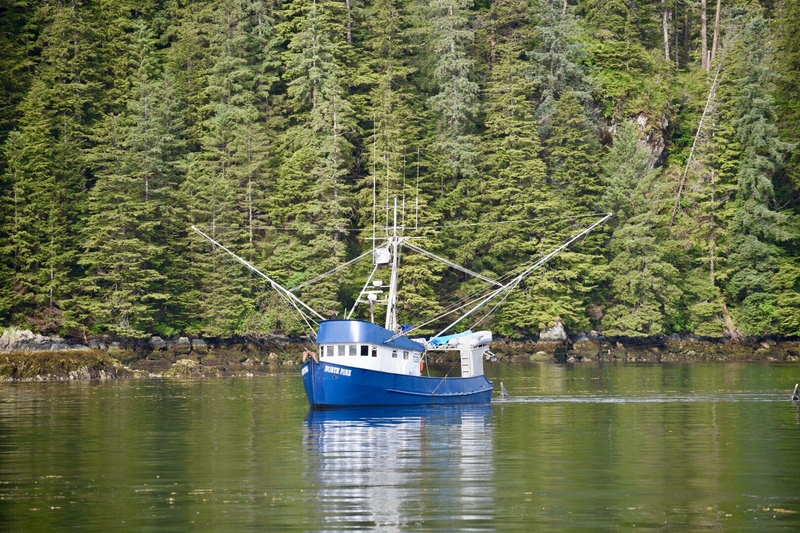 These boats utilize a small tow boat to ring a net around a school of salmon. The net is then drawn up with the catch. 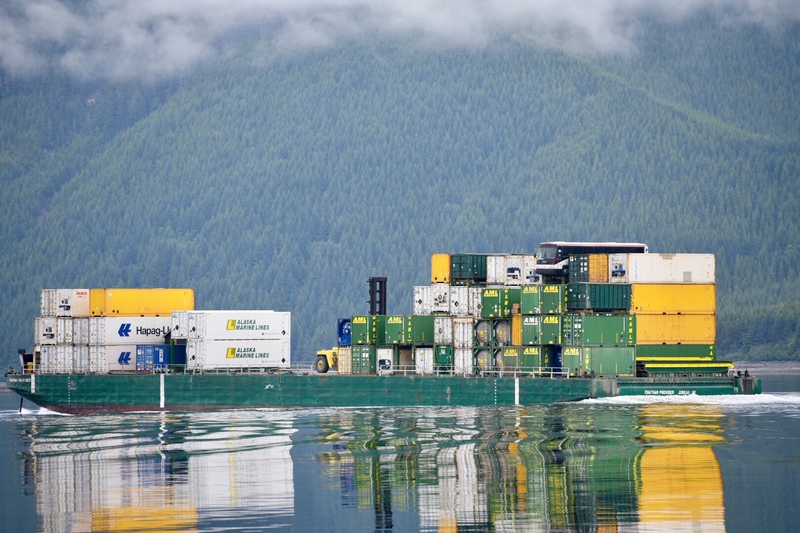 We saw quite a few of these boats at the Sitka docks. Our trip today was timed to arrive at Sergius Rapids at slack tide. We are getting more comfortable with transiting rapids as we have done quite a few over the last two years. Just our luck though, we have a barge and tow that we are going to meet somewhere close to the rapids. The Western Mariner is showing up on our AIS heading south. We decide to transit the rapids about fifteen minutes early and get through just before he arrives. 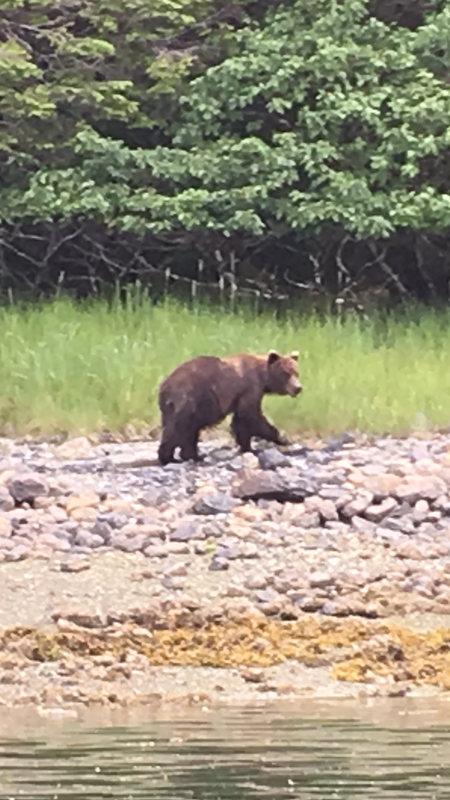 Our anchorage named Baby Bear is just one mile past the narrows. Getting into the anchorage requires some slow and careful maneuvering around a dangerous reef called “Sharks teeth”. I am on the bow watching for rocks as Jeff carefully maneuvers through the narrow circuitous entrance. The long thick strands of Kelp help mark the shoal. We are rewarded with a beautiful landlocked bay completely isolated from the outside world. 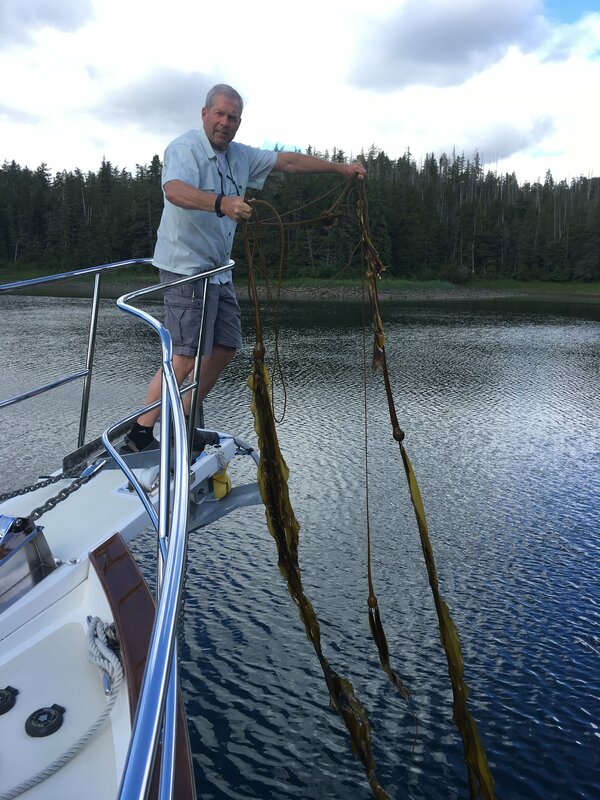 After anchoring, we discover some Kelp which had been hooked by our stabilizer. It is easily removed with the boat hook. Wendy and Leigh on Forever Exploring join us this afternoon. We spend a rest day enjoying Bay Bear while doing boat chores. We find time to also explore by kayak and some fishing in the dinghy. As we are fishing, I notice a movement on the shore. 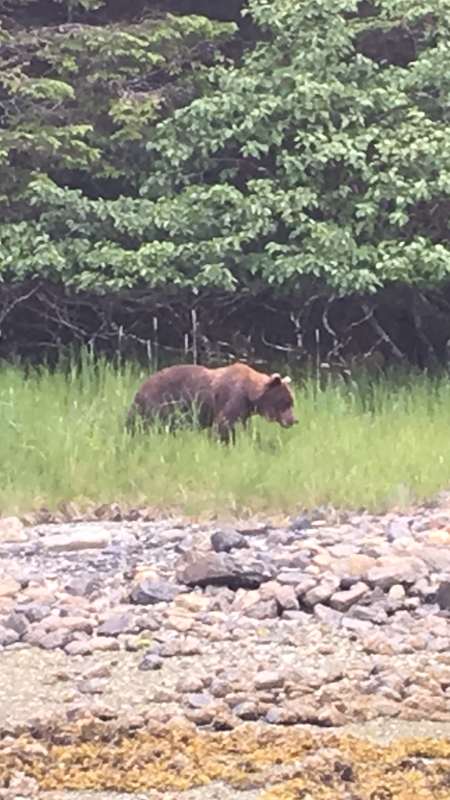 We quickly realize it is a Brown Bear searching the shoreline for food. We turn the motor off and quietly drift towards this hugh carnivore. He briefly puts his snout in the air to wind us and apparently determines we are not a threat and goes back to feeding. At one point, he even lays down while munching on some tender grass tips. Fifteen minutes later, he wonders off into the woods. We head back to the boat in awe of what we just witnessed. I guess Baby Bear is a fitting name for this anchorage. Our destination today is an anchorage called Pavlov Harbor on Chicaghof Island. Leaving at low tide, the ugly “sharks teeth” reef is clearly visible this morning with these extreme 20 ft. tides. Kelp helps mark the dangerous rocks. We retrace our path out Peril Strait following Forever Exploring . 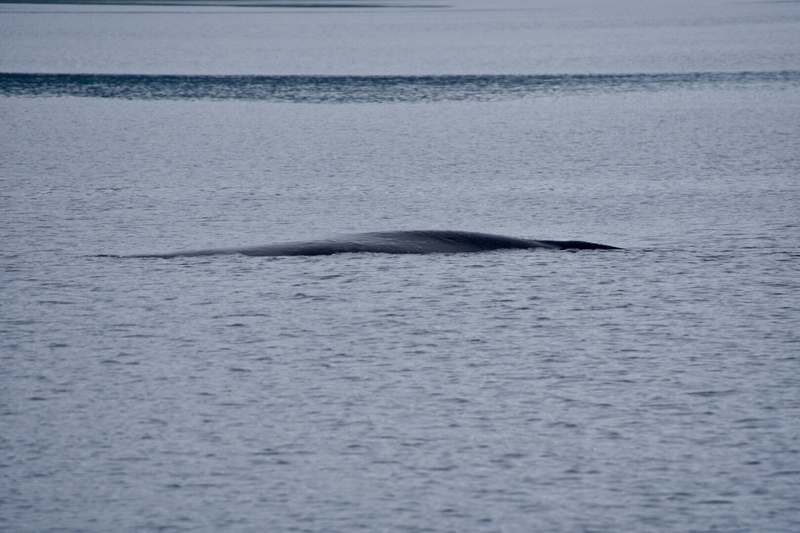 As we are entering Chatham Strait, we spot a grey blob just at the surface of the glassy smooth water. It is near the buoy marking a shoal but still well outside where the rocks should be. This object is not moving. There are still uncharted rocks in Alaska as some areas have not been surveyed since the 1940’s and then only partially. We cautiously steer around this object as a debate ensues in the pilothouse as to what it could be. All of a sudden the “rock” exhales a mist of water. 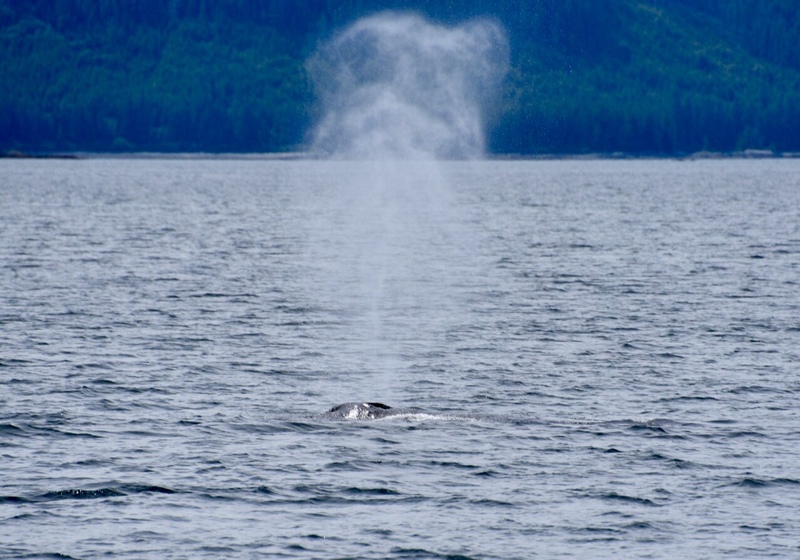 It is a sleeping whale. We hover for about ten minutes being careful not to wake this sleeping giant. Slowly he appears to wake up and begins moving forward. 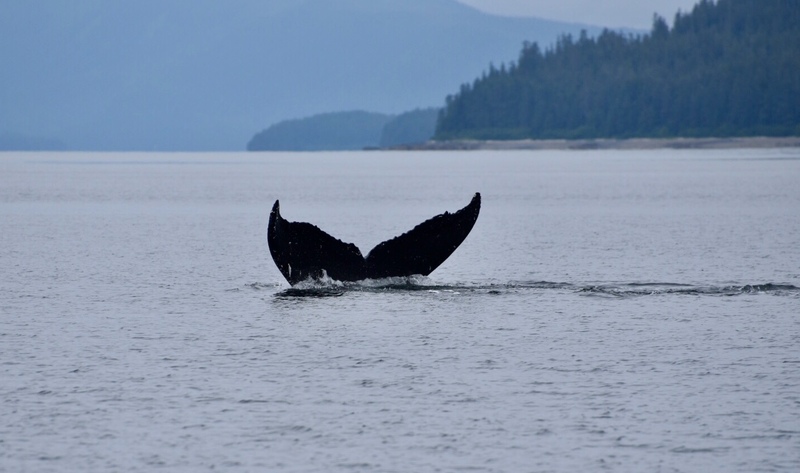 A few breaths later he flips his massive tail into the air and sounds into the depths of Chatham Strait. It was a magical moment. As we enter Freshwater Bay we see a small cruise ship Wilderness Explorer leaving our anchorage. Slowly entering Pavlov Harbor we are careful to avoid the “real” Pinnacle rock that is warned about in our guide book. We anchor just off the sandy beach near a beautiful waterfall all alone in the anchorage. Pavlov is a State Park with a wilderness trail from the beach to a secluded lake. This area is also know for its tremendous brown bear population. With a light rain falling, we decide to skip this hike and stay aboard for the afternoon. 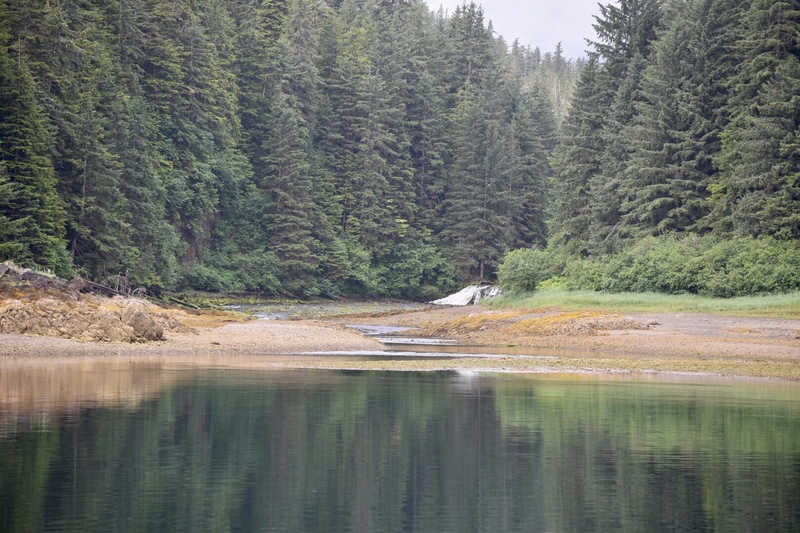 As low tide approaches, we spot several bears meandering from the woods down to the waterline. They spend about an hour searching the shore for food. 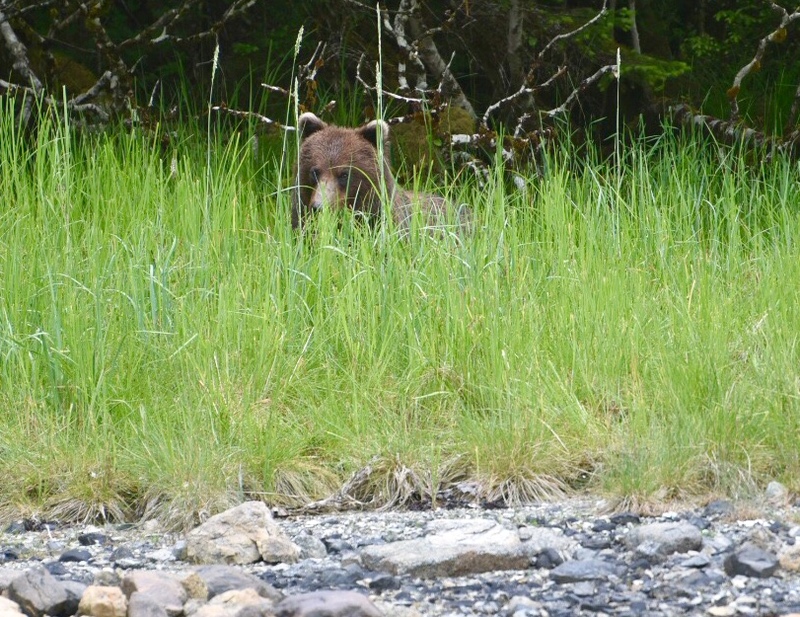 Several more bears appear a short while later and graze on the tall grass. We are now feeling really good with our decision to stay aboard. This entry was posted on July 23, 2018 at 7:04 pm. You can follow any responses to this entry through the RSS 2.0 feed. You can leave a response, or trackback from your own site.